Artist EH Shepard's classic illustrations of The Wind in the Willows & Winnie-the-Pooh are going under the hammer and are being sold by the members of his family. 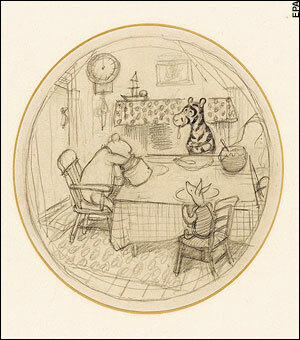 A pencil drawing in a large oval shape which depicts Pooh bear putting his hands into a honey pot for that last remaining honey lick, whereas his friends Piglet & Tigger sit around a kitchen table watching him. This sketch is expected to be sold for anywhere near to £20,000. This sketch is an enlarged version of the original illustration "Tiggers don't like honey" which AA Milne used in The House at Pooh Corner. One of the other EH Shepard's illustrations which is to be auctioned is that of Christopher Robin saluting a guard. This was done for AA Milne's poem Buckingham Palace.